Walter Dean Myers is known for his creative and unique writing styles when it comes to children’s literature. This book is no exception. It is written as a screenplay complete with directions for the camera shots. While listening to the full cast audiobook with sound effects and music, I felt like I was “watching” the story as well as listening to it. In addition to bringing to life an historic event that was “new to me”, Riot touched on issues that have recently been getting a lot of attention such as biases in reporting events, the promotion of ethnic stereotypes and the politicizing of events to divide people and incite violence. The year is 1863 and the Civil War has been raging for 2 years. Claire Johnson spends a lot of time at the Peacock Inn in New York City where her black father and Irish mother work. She passes as white but doesn’t really think about her ethnicity. Her best friend Priscilla Skinner, who is black, is also 15 and spends a lot of time with Claire when she isn’t volunteering at the Colored Orphan Asylum. Trouble has been brewing in the New York Streets of Claire’s Five Points neighborhood ever since Lincoln instituted the draft. As draftees are chosen by names being picked out of a barrel, many Irish gangs and citizens start rioting against the draft, destroying public and private property and attacking black citizens. It is soon discovered by a classmate that Claire’s father is black. So what does that make Claire? Being biracial, is she black or white? Claire feels lost and also feels despair that she isn’t being allowed to define herself, but is being defined by others based on the color of her parents. 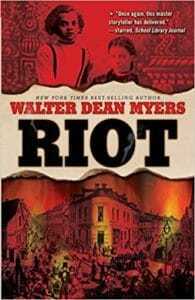 While Claire is the novel’s protagonist, Riot’s large cast allows many points of view to be examined, including those of Irish gang members, Union soldiers, police officers and even a cameo appearance by Walt Whitman. The audiobook includes a timeline of the riots, an author’s note and an interview with Walter Dean Myers.